Upon GTP hydrolysis, the affinity of Gas for AC is reduced about 10-fold . The most potent factor in signal termination may be the high affinity of GPy for Ga^GDP. 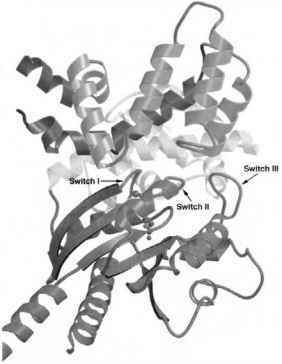 GPy binds to the effector-binding surface of Ga but requires a conformation of Switch II that cannot be attained in the GTP-bound state. This nonsignaling state of Ga is stable in the presence of GDP and exhibits high affinity for GPy . Receptor-catalyzed exchange of GDP for GTP also causes full or partial dissociation from GPy. When not bound to Ga, GPy subunits are able to regulate other effectors such as inward-rectifying potassium channels  and phospholipase CP isoforms . Thus, receptor-activation of a G protein heterotrimer releases two regulatory species that can act independently or coordi-nately on downstream effectors. Five closely related GP sub-units have been described, together with 12 isoforms of Gy. blades of a propeller from the central axis of the molecule (Fig. 6) [45,47]. The seven-fold symmetry is reflected in the amino acid sequence of GP, which is composed of seven so-called WD (or WD40) repeats, represented by the consensus sequence [GHX3-502X0X0X5-60(S/T)(G/A)X3DX4WD], where X is any residue, O denotes a hydrophobic residue, and parentheses enclose alternate possibilities . The sequence repeat is staggered with respect to the structural repeat (one propeller "blade") such that the first P-strand within the WD motif corresponds to the last P strand of the n-Ith blade, and the following three P strands of the WD constitute the first three strands of the nth blade. This construction ensures a lap-joint in which the N- and C-terminal strands of the propeller are hydrogen-bonded to each other. The first of the two Asp residues in the motif is invariant and participates in a hydrogen-bonded network with the His, Ser/Thr, and Trp residues in most of the blades. The first «40 residues of GP, preceding the seven-bladed propeller, are folded into an a helix. The Gy subunit is an extended molecule consisting of three a-helical segments that do not contact each other. Gy subunits are farnesylated (Gyi, Gyh) or geranylgeranylated (all others) at their C termini, thereby tethering them to the plasma membrane and promoting high-affinity interactions between GPy and Ga subunits and with effectors (see references in ). The N-terminal helix of Gy forms a parallel coiled-coil with that of Gy. The second and third helices lie over the surface of the GP torus that is formed by the AB and CD P-strands of each propeller. This surface contains two hydrophobic pockets, located between successive propellers, that accept nonpolar residues from the end of Gy helix 3 and the succeeding loop region [48,49]. The Gy binding surface is highly conserved among the five isoforms of Gp. The limited selectivity between Gp and Gy isoforms seems to involve the interaction of hydrophobic residues in helix 2 of Gy with its binding surface on Gp. Gp5 is the most divergent among the five isoforms of Gp. It has recently been shown to interact most strongly with the G-gamma-like domains (GGLs) present in a variety of proteins, most notably the members of the RGS11 family [50,51]. Ga binds to the surface of Gp opposite that to which Gy is bound (Fig. 7). Ga interacts with Gp at two distinct and separate surfaces, both of which are required for high-affinity binding. The N-terminal helix of Ga contacts the side of the Gp torus at blade 1. The Ras-like domain of Ga binds Gp at Switch I and Switch II. All of the residues of Gp that contact Ga are conserved among Gp isoforms. Although the Gp-binding residues within the Ras domain of Ga are well conserved, the N-terminal helix of Ga is more variable, and this might confer some degree of conformational specificity to Ga-Gp interactions. The orientation of this helix with respect to Gp1 differs in complexes with Ga;1 and Gat. 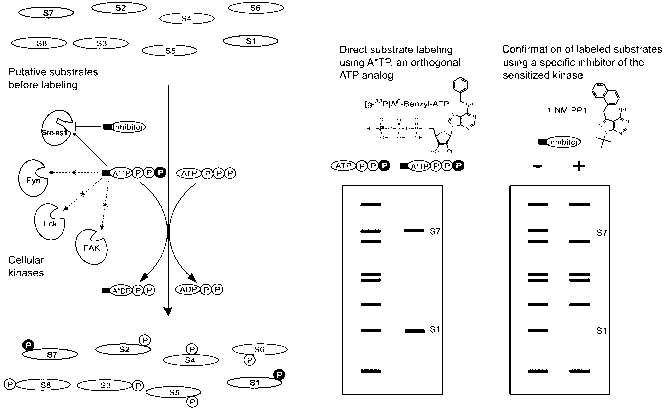 A series of mutagenesis studies have demonstrated that several effectors of Gpy, including PLCp2, p-adreneric receptor kinase, type II adenylyl cyclase, G-protein-regulated inward rectifying potassium channels (GIRK), and the calcium channel a1B subunit, all contact Gpy at the same molecular surface to which Ga subunits binds .